Everyone wants to get huge biceps. Women love guys who have bicep muscles that just bulge out of their shirt sleeves. However, most of the guys who visit the gym week after week fail to get the kind of bicep growth they’re seeking. In this article I want to share with you some awesome tips to help you get huge monster biceps to impress anyone you meet. These tips will help you build strength as well so you won’t just look powerful you’ll be powerful as well. 1. Pack it on – You will never going to get huge biceps unless you pack on the weight. This is true for all muscles. If you can do 20 reps with a specific weight you may get some growth but it won’t be impressive. To really shoot for massive muscle gain, you need to use weights that you can do 8-10 reps with. Sometimes, you’ll even go for a 6 reps set to really strain the muscles. 2. 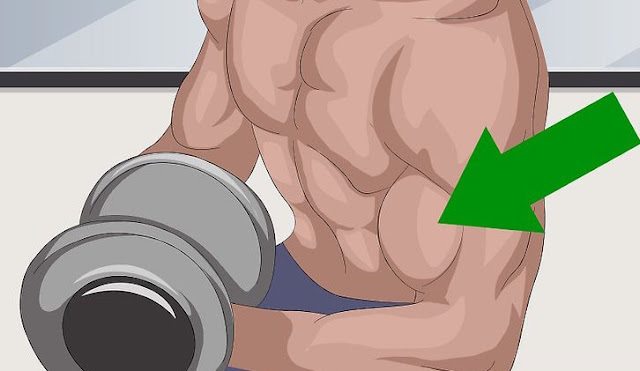 Look at the bigger picture – While working the biceps directly is important, you need to look at the bigger picture: the bicep is a small muscle group and it won’t grow to its full potential unless you also strengthen your bigger muscles groups. These include the back, chest, and shoulders. Working your entire body is a must if you want to get the biggest biceps you can. 3. Don’t over do it – While you may want to get fast results, you need to understand that you can’t overtrain. You need to let your muscles rest for them to grow. This is why I recommend doing 2 workouts per week on each muscle group (biceps included) with a 2 day resting period in between. You can train other muscle groups on those rest days, but not the biceps. 4. Switch it up – If you do the same exercise over and over again, your body will get used to it. You need to change things up, switch exercises, use weights, bar, and workout tubes. Also, don’t forget negative exercises to really boost the effectiveness of your workout. Change your workout routine every 6 weeks or so for maximum growth. 5. Eat right and smart – You need to feed the muscles for them to grow. Don’t expect that training will get you results alone. Give your body the protein it craves after a workout, make sure to eat enough to produce muscle growth, and don’t pump yourself silly with supplements before giving natural food a chance.